Why is it strategic for a gallery of your size to have more than one location in New York? 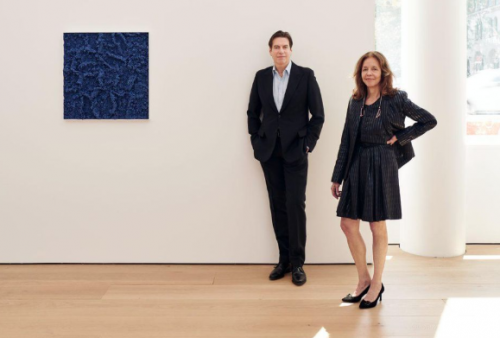 Lehmann: We have operated two locations in New York for most of the gallery’s history, in Chelsea and the Lower East Side, however it became clear that Chelsea, still being the epicenter of the New York art world, was where our focus should be. Maupin: A core part of Lehmann Maupin’s program is introducing international artists in the US (Kader Attia, Nicholas Hlobo, Lee Bul, Tracey Emin, Do Ho Suh, and Adriana Varejao all had their first NY or US exhibitions at Lehmann Maupin) and having two locations here is crucial to accomplish this. Your LES location closed at the end of 2017. Why did you decide to relocate to Chelsea to The Getty instead of another LES location? Maupin: The location was too good to pass up. There are very few corner locations left in the neighborhood, and the opportunity to custom build a space was even better. Lehmann: The foot traffic in Chelsea is still far greater than any other area, and when we have clients, curators, and guests in town, they primarily come to Chelsea. Of all the buildings in Chelsea you selected for your location, why did you select The Getty? Did you already have a relationship with Peter Marino? Maupin: Peter is a long time personal friend of both mine and Rachel’s and client of the gallery for over 20 years. We knew he understood the gallery’s aesthetic and goals, and even more importantly, instinctively knew the needs of our artists. Tell me about how you designed the layout of the space. What kinds of things did you take into account when you organized it? Lehmann: We built the gallery looking at each element through the eyes of an artist. Light, height, and proportion therefore became the priorities, and Peter is masterful at creating a balance of these. Each gallery was designed as its own unique viewing space as well, offering formats for different media, or creating different environments within a single exhibition. How long are you planning to be at that location? Lehmann: This is our primary location now, we own the space and we are very happy with the result, so we will be based there for the foreseeable long term future. Your opening show at this space is Liza Lou. Why did you select her? Maupin: I first encountered Liza’s work at The New Museum in 1996, her first exhibition in New York, and also the year Lehmann Maupin opened. While we have represented her since just 2016, I have been watching her for over 20 years. We knew she was working on this incredible body of work for the past three years, and wanted to make as much of a statement as possible in launching the new gallery. It’s Liza’s return to exhibit in New York after 10 years, and giving her the inaugural show felt right. The range of media—painting, sculpture, video, and drawing—became the perfect example of how the gallery could accommodate such a varied body of work as well. What other shows do you have in the works that we should watch out for? Lehmann: We also just opened the first New York exhibition for Suh Se Ok, an incredibly important Korean artist who is 89 years old. All of these works have never been seen in the US, so it’s an extremely rare and significant show. Maupin: We will be showing a new body of work by Catherine Opie, including her first film, The Modernist, in November, and in January, the gallery’s debut exhibition for McArthur Binion, a very important, though overlooked artist. His paintings appear to be minimalist, but upon closer inspection, are actually quite layered and intricate. How has Chelsea evolved since you first moved there? Lehmann: We moved from SoHo to Chelsea in early 2000s. It was, and still is, an incredible art destination, but now with the Whitney Museum relocated here, the High Line, and The Shed at Hudson Yards opening soon, it has truly become a world class destination. Obviously it has become more expensive too, but we were confident that we needed to make the investment. You also have locations in Hong Kong and Seoul. Why those markets? How do those tastes differ from New York? Maupin: We’ve had a historic connection to both cities through the artists we show, including Do Ho Suh, Lee Bul, Kim Guiline, Suh Se Ok, Mr. and Liu Wei. We were early adopters in moving to Hong Kong in 2013, when we knew it would be a crucial outpost to connect to greater Asia. You must build these relationships, not just once a year at fairs and biennales, to demonstrate your investment in the culture there if you want to build trust with collectors and institutions. Face time is crucially important. I just returned from Hong Kong, and either Rachel or myself are in the region almost every month. Lehmann: Introducing international artists outside their region is part of the DNA of the gallery. Since 1998, when we gave Do Ho Suh his first US exhibition, we have introduced many Asian artists in the US. 15 years later, we did the reverse, bringing western artists to Hong Kong for their first shows in Asia. We don't take the position that we cater to different cultural tastes, but rather make the effort to open new markets. There are too many fairs. Mid-level galleries are struggling to survive. Inequality in programming and museums is prevalent. What do you think are the biggest problems in the art world at the moment? Do you have any solutions? Lehmann: Inequality is a huge problem. I can say from experience, I was not taken seriously as a professional until I opened the gallery in New York. This impacts artists enormously too. Having a program that represents a global diversity—racially, ethnically, culturally—with an emphasis on showing women on par with men, was an early focus in the gallery and one we continue today. I’m glad many are catching on to the potential, in the market and institutionally, for women and other marginalized artists, but they have always been here! Galleries like Lehmann Maupin that have been focused on these artists long term have helped shape the institutional focus on exhibiting and acquiring works by women and artists of color who have been overlooked, and the market is responding. This must continue as a long term strategy, and not just a trend, to actually push the market to greater equality.